The PopuList offers academics and journalists an overview of populist, far right, far left and Eurosceptic parties in Europe since 1998. The PopuList is supported by the Amsterdam Institute for Social Science Research, The Guardian, and the ECPR Standing Group on Extremism and Democracy. Here’s a pdf version of The PopuList. This is the dataset in xlsx format. Visual representations of the list can be found here and here. Rooduijn, M., Van Kessel, S., Froio, C., Pirro, A., De Lange, S., Halikiopoulou, D., Lewis, P., Mudde, C. & Taggart, P. (2019). The PopuList: An Overview of Populist, Far Right, Far Left and Eurosceptic Parties in Europe. http://www.popu-list.org. The PopuList is the result of close cooperation between academics and journalists, initiated by The Guardian. The list consists of European parties that can be classified as populist, far right, far left and/or Eurosceptic, and obtained at least 2% of the vote in at least one national parliamentary election since 1998. The list has been thoroughly peer-reviewed by more than 30 academics. See here for how The Guardian has used the list. Of course, The PopuList is not perfect. Not everybody will agree with the employed definitions and/or party categorizations – in particular with respect to borderline cases. Moreover, The PopuList is still work in progress. Nonetheless, we believe that this is one of the most complete, up-to-date, and carefully designed classifications of populist, far left, far right and Eurosceptic parties in the field. On this website we will keep The PopuList up to date. Every couple of months we will update the list based on feedback we receive and the outcomes of recent national parliamentary elections (always in consultation with country and party experts). In a next version of the list we’ll subdivide the rather crude category of Euroscepticism in ‘hard’ and ‘soft’ varieties. In future versions we also hope to go back further in time (now we focus on the last 2 decades only), and to include more information on changes in parties’ far right, far left and Eurosceptic positions (now we only look at changes in their populism). Matthijs Rooduijn, University of Amsterdam (contact m.rooduijn@uva.nl for questions, comments and suggestions); Stijn van Kessel, Queen Mary University of London; Caterina Froio, Sciences Po; Andrea Pirro, Scuola Normale Superiore; Sarah de Lange, University of Amsterdam; Daphne Halikiopoulou, University of Reading; Paul Lewis, The Guardian; Cas Mudde, University of Georgia; Paul Taggart, University of Sussex. Populist parties: parties that endorse the set of ideas that society is ultimately separated into two homogeneous and antagonistic groups, “the pure people” versus “the corrupt elite,” and which argues that politics should be an expression of the volonté générale (general will) of the people (Mudde 2004). 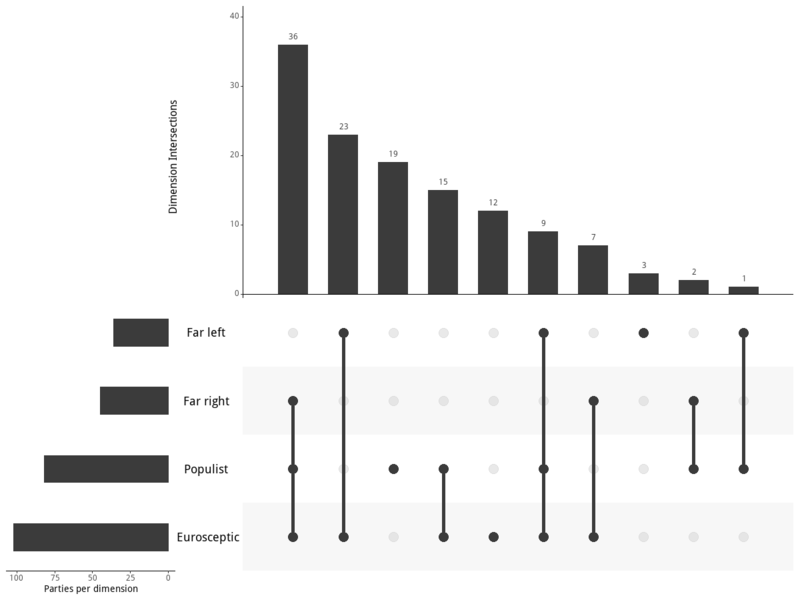 Far right parties: parties that are nativist (which is an ideology that holds that states should be inhabited exclusively by members of the native group and that nonnative elements are fundamentally threatening to the homogenous nation-state) and authoritarian (which is the belief in a strictly ordered society, in which infringements of authority are to be punished severely) (Mudde 2007). Far left parties: parties that reject the underlying socio-economic structure of contemporary capitalism and advocate alternative economic and power structures. They see economic inequality as the basis of existing political and social arrangements and call for a major redistribution of resources from existing political elites (March 2012). Eurosceptic parties: parties that express the idea of contingent or qualified opposition, as well as incorporating outright and unqualified opposition to the process of European integration. This includes both “hard Euroscepticism” (i.e., outright rejection of the entire project of European political and economic integration, and opposition to one’s country joining or remaining a member of the EU) and “soft Euroscepticism” (i.e., contingent or qualified opposition to European integration) (Taggart and Sczcerbiak 2004). Sarah Engler, University of Bern; Martin Eiermann, University of California, Berkeley; Kevin Deegan-Krause, Wayne State University; Benjamin Moffitt, Australian Catholic University; Raul Gomez, University of Liverpool; Elisabeth Carter, Keele University; Carlo Invernizzi-Accetti, City College of New York; Ben Stanley, SWPS University, Warsaw; Lorenzo Pregliasco, University of Bologna; Matteo Cavallaro, University of Paris 13; Luis Ramiro, University of Leicester; Reinhard Heinisch, University of Salzburg; Peter Spác, Masaryk University; Ilze Balcere, University of Latvia; Ólafur Þórður Harðarson, University of Iceland; Paul Sum, University of North Dakota; Sergiu Gherghina, University of Glasgow; Hulda Þórisdóttir, University of Iceland; Allan Sikk, UCL; Algis Krupavicius, Vytautas Magnus University; Mindaugas Jurkynas, Vytautas Magnus University; Bram Spruyt, Vrije Universiteit Brussel; Elina Kestilä-Kekkonen, University of Tampere; Duncan McDonnell, Griffith University; Daniele Albertazzi, University of Birmingham; Paris Aslanidis, Yale University; Matthew Goodwin, University of Kent; Anders Ravik Jupskås, University of Oslo; Marijana Grbesa and Berto Salaj, Zagreb University. March, L. (2012). Radical Left Parties in Europe. London: Routledge. Mudde, C. (2004). The Populist Zeitgeist. Government and Opposition, 39(4), 541-563. Taggart, P., & Szczerbiak, A. (2004). Contemporary Euroscepticism in the party systems of the European Union candidate states of Central and Eastern Europe. European Journal of Political Research, 43(1), 1-27.